This week's roundup covers play from the period of October 26- November 1. For the full list of Red Sox prospects participating in offseason action, check out our Fall and Winter Leagues page, which will be updated continuously through the end of the offseason. 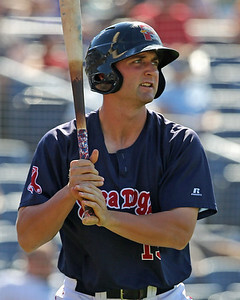 MLB announced the participants in this Saturday's Fall Stars Game on Monday, and Sam Travis (pictured) was the lone Red Sox honoree. ?The game will be broadcast live on the MLB Network and streamed on MLB.com at 8 p.m. The honor caps a week in which the first baseman was on fire. SoxProspects.com's ninth-ranked prospect went 8 for 16 with a double, two walks, and a sacrifice fly. He had a three-hit game and a four-hit game. Most notably, Travis has cut down on his strikeouts, punching out just once in 19 plate appearances this past week. He is now hitting .319/.377/.447 in 11 games this fall. His fellow Red Sox in Scottsdale did not fare as well: Carlos Asuaje went 3 for 13 with a walk and three RBI and Tzu-Wei Lin went 2 for 10 with a walk and a run in three games. Justin Haley made his AFL debut on Friday and went three innings as the starter, allowing one earned run on one hit, one walk, and one strikeout without allowing a run. Left-hander Danny Rosenbaum tossed two scoreless innings in relief on Wednesday. Kyle Martin earned a save, striking out two in a perfect inning. Chandler Shepard had a rough outing followed up by a much better showing. He gave up three earned runs on a home run and two walks in an inning of work on Tuesday, but tossed 1 1/3 perfect innings with two strikeouts on Saturday. 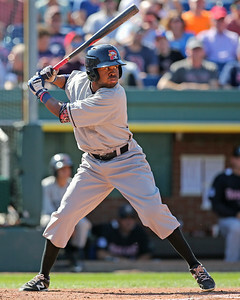 Manuel Margot (pictured) had the best week of any Red Sox prospect in the Dominican this past week. He went 5 for 16 with a home run (off of big leaguer Phil Coke), a triple, and two walks. Rafael Devers had a pair of hits in nine plate appearances, including a double and a walk. Marco Hernandez, after his scorching start to the fall, has fallen into a cold spell of late. He went hitless in 14 at-bats over the last week. He struck out just twice but did not take a walk, and his batting average is down to .270. Aneury Tavarez got into a game as a pinch runner. Ramon Mendez got into two games, with one going well and one not so well. On Thursday, he struck out the side in his only inning of work. On Saturday, he lasted just 1/3 of an inning, giving up two hits, two walks, and four earned runs. In Venezuela, Edwin Escobar made a start and was able to dance around trouble, giving up just one earned run in 3 2/3 innings despite giving up four hits and four walks. Sandy Leon (whose days with the franchise may be numbered) also went 4 for 13 with a home run and three walks. Recent indy ball signee Rob Wort also made two relief appearances and allowed one run. Among the pending free agents most recently affiliated with the Red Sox, there were some solid performances. Carlos Rivero, a free agent, went 5 for 18 with a grand slam, three doubles, and two walks. Chris Marrero, another free agent, went 3 for 9 with two doubles. Luis Diaz and William Cuevas started against each other on Wednesday and each went five innings and gave up one earned run. Diaz gave up five hits and no walks, and struck out four while Cuevas gave up four hits and two walks, and struck out six. Dayan Diaz made two appearances and tossed 1 1/3 innings while allowing no runs, one hit, and two walks. Puerto Rico's winter league began on Friday. So far, Henry Ramos, Travis Shaw, and Christian Vasquez have seen action offensively. Ramos is off to a 3 for 7 start, Shaw is 0 for 4, and Vazquez is 1 for 4 with a double. Hard-throwing right-hander Pat Light has an inning under his belt, allowing no runs, a hit, and one strikeout. Shortstop Jeremy Rivera and outfielder Joseph Monge round out the list of Red Sox affiliates in the league, but neither is expected to get much playing time. Isaias Lucena had a huge week in the Venezuelan Development Program, collecting seven hits including two doubles and three runs scored. He's now hitting .333 this fall. Ramfis Berroa also had a good showing, rapping a double, triple and a home run. He now has two home runs and is slugging .444 in 72 fall at-bats. A pair of center fielders debuted after returning to Venezuela following the Fall Instructional League: Luis Alexander Basabe saw his first action on Saturday and went 2 for 4, while Lorenzo Cedrola debuted on Monday and went 4 for 15. Carlos Tovar added a home run as well. Boston received three solid starting pitching performances from Hildemaro Requena, Eduard Bazardo, and Angel Padron. Requena went five innings and allowed one run, Bazardo went six innings and allowed one run, and Padron went five innings and allowed one run as well. Ritzi Mendoza was solid in relief, totaling 4 1/3 innings while allowing just one run.